The iPhone X is priced at $999 for the 64GB model and $1,149 for the 256GB version, compared to the S9 Plus which comes in at $840 for a 64GB model with a microSD slot that supports up to 256GB. You can buy a suitable memory card for around $100, which equates to a total storage capacity of 320GB for approximately $50 less than a 64GB iPhone X. That being said, microSD storage speed is still extremely limited when compared to the X's internal data bus, so while it is nice to have that extra capacity, it's still going to be slower to access compared to the built-in storage. Both phones have a really premium feel thanks to the all metal and glass construction but the build quality of the iPhone X is more preferable. The screen is really nice on the S9 Plus with a higher resolution that provides a sharper image and less color shift when viewing at off angles, but while we prefer the larger size of the display for watching videos, the phone is uncomfortable in your hand. The iPhone 8 Plus is similar in this regard, while the iPhone X's smaller form factor is perfect for most people. Honestly, the notch on the iPhone X is pretty distracting and annoying when watching full-screen videos. The S9 Plus definitely takes the cake with its infinity display. The always-on feature of the S9 Plus' screen is quite handy, giving the handset one desirable feature that the OLED-toting iPhone X could've implemented. The S9 Plus has a USB-C charging port, which is much more functional compared to Lightning. Samsung also decided to keep the 3.5mm headphone jack around in the S9 Plus. This may be a big deal for some people, but after using Apple's AirPods for months, there is little desire to return to wired headphones. In terms of performance, the iPhone X completely blew the Note 8 out of the water, but this year, the S9 Plus has caught up. There isn't that much improvement in terms of processing performance, but graphics is around 50% more powerful. The iPhone X is still ahead overall, but the S9 Plus is right behind. The saving grace for the Samsung is that it has twice as much RAM as the iPhone X, allowing apps to stay open in the background for longer periods of time. The S9 Plus now has stereo speakers, just like the iPhone X, and they sound really clear. It's a tough comparison between both phones, but the iPhone seems to have clearer mids and sharper highs, though it's all up to user preference anyway. Next up, Samsung relocated the fingerprint scanner below the rear cameras. It used to be on the right-hand side of the cameras, and was extremely inconvenient as users had to stretch their hand behind the phone to reach it, making the new placement very natural and comfortable by comparison. . In comparing Face ID to Samsung's Face Unlock and Iris Scanning, Face ID won that battle in terms of reliability, security and convenience. Note 8's Face Unlock could be fooled by a simple photo and wouldn't work in the dark, while Iris Scanning ran into reliability issues and would sometimes require the phone to be extremely close to our face. The S9 Plus has Samsung's new Intelligent Scan feature which combines both Face Unlock and Iris scanning for more secure and reliable authentication. It'll work in the dark and is no longer fooled by photos, but unfortunately you can't use Samsung Pay with the feature. Samsung's mobile payment solution is only available when using Iris Scanning or the fingerprint scanner. Face ID on the other hand, can be used for basically everything on your phone, including third party apps. Samsung has introduced AR Emoji to combat Apple's Animoji, but it was found to be extremely lacking when put against Apple's face-based feature. The S9 and S9 Plus have a new dual aperture camera on the back that works by automatically switching between two f-stop modes to adapt to different lighting conditions. The F1.5 aperture mode lets in more light for cleaner lowlight images, and the F2.4 mode results in sharper photos. Both phones were extremely similar in terms of photo detail. The X definitely had better colors overall in tests, but it didn't perform as well at blurring backgrounds in Portrait Mode. The S9 Plus has less noise in low-light while retaining more detail in shots. The X however has a slow-sync flash, helping make nighttime flash photos look a lot more natural compared to photos taken on the S9 Plus. Overall, both phones are around even in terms of camera quality. The S9 Plus now sports 4K video recording at 60 frames per second, but a few issues were experienced when using the mode. Recording of 4K 60 video is limited to just 5 minutes per clip, while a 10-minute limit is applied for recordings in regular 4K, Quad-HD, and 1080P 60 modes. There are no such limitations for video length on the iPhone X. 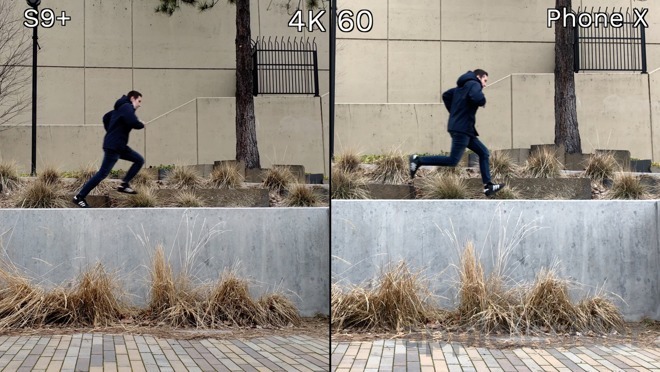 Comparing the Samsung's 4K video at both 30 and 60 frames per second revealed a substantial loss in detail when recording in 4K 60. The S9 and S9 Plus also have a new High Efficiency mode, just like the one on the iPhone 8 and X, but there's currently a huge issue with it. Video clips shot in High Efficiency 4K get corrupted when you transfer them to a Mac or PC, regardless of how you do it, so it is ill advised to use High Efficiency mode in this manner until Samsung fixes the problem. As expected from an Android phone, Samsung's S9 Plus is definitely more customizable than an iPhone, with modification options offered for everything from settings to home screen widgets. For example, you can view your full calendar on one of your home screen pages, without having to tap into the widget like you have to do on iPhone X. There's substantially more settings you can customize on the S9 Plus, whereas on the iPhone X, Apple limits the list to changes most people can understand. 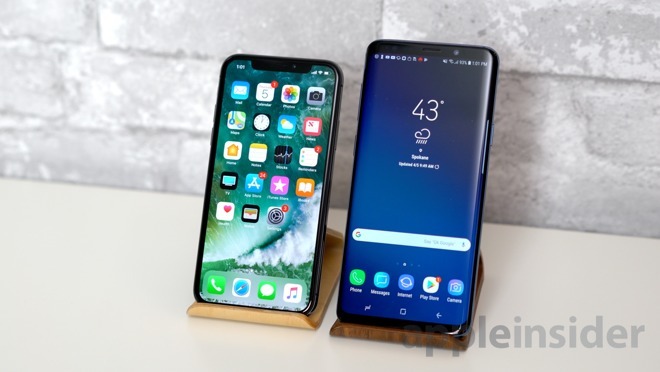 Looking broadly at Apple and Samsung, it's obvious that Apple focuses on making their devices and features easy to setup and use, so they can broaden their market and satisfy more customers. Samsung, on the other hand, gives users freedom of customization and as many features as they can pack into a device, rarely getting rid of old functionality. That's why the S9 Plus still has the headphone jack and various biometric authentication methods like the fingerprint scanner. Apple, on the other hand, got rid of the headphone jack and fingerprint scanner without flinching. At the end of the day, both the iPhone X and Galaxy S9 Plus are great phones. They're more than powerful enough for most consumers, pack top-of-the-line mobile camera systems and come with the best displays you can get your hands on. Your purchasing decision should actually rely on which user interface you enjoy the most, and which features are more useful for you.